The room smelled of antiseptic, bright fluorescent lights overhead, purely functional furniture. But the hands touching me were light, friendly, trying to soothe. 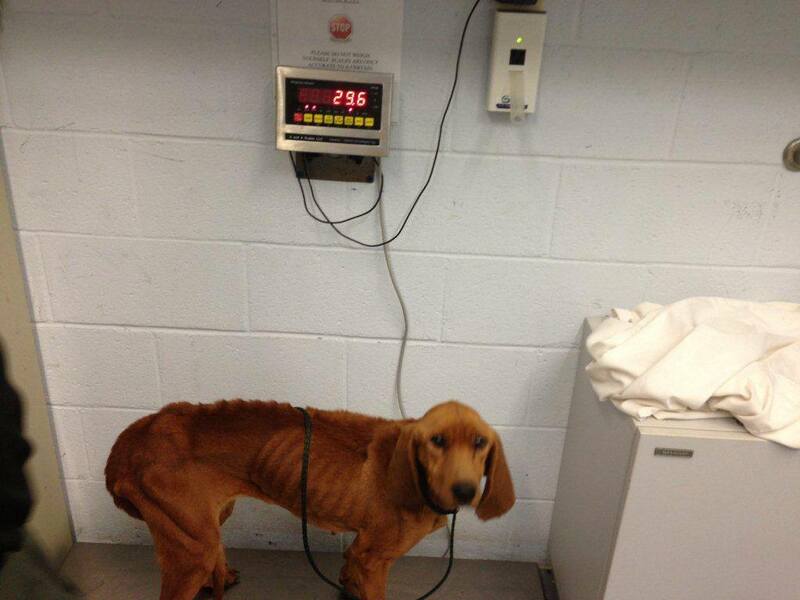 I wanted so much to trust them, after all they brought me in, put a roof over my head, were giving me food and water. My tail remained tucked, suspicious and scared, but I complied with their wishes, stood on that scale and allowed them to take pictures of me. When the photos landed on facebook it didn’t take long for the calls and emails to come in and I would learn later that one of those first calls was from the woman who would become my forever mom. 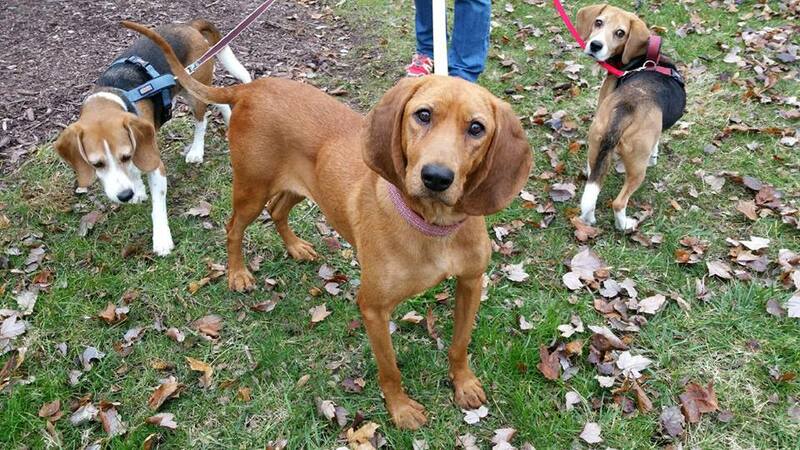 The American Black and Tan Coonhound Rescue Group found a foster mom who was nearby and able to come get me at the animal shelter in Surry County North Carolina – hence my name. Another friendly face, Debbie, plucked me up and put me in the back of her car, which she had filled with blankets and a bed. She got me cleaned up, got me a sweater and my rehab began. Regular meals, lots and lots of sleep in a super warm bed and love from humans, something I was not at all used to. Soon I felt good enough to play with my foster brothers and sisters, although Debbie was worried about me initially because I was so emaciated, she thought I might get hurt. I started to fill out, albeit, slowly. I didn’t even weigh enough to checked out by the vet and get my shots and I wasn’t even close to heavy enough to get spayed and I couldn’t go to my forever home until after that. But I wasn’t concerned about any of that because I had Debbie and a pack to play with and I was feeling better and better every day. 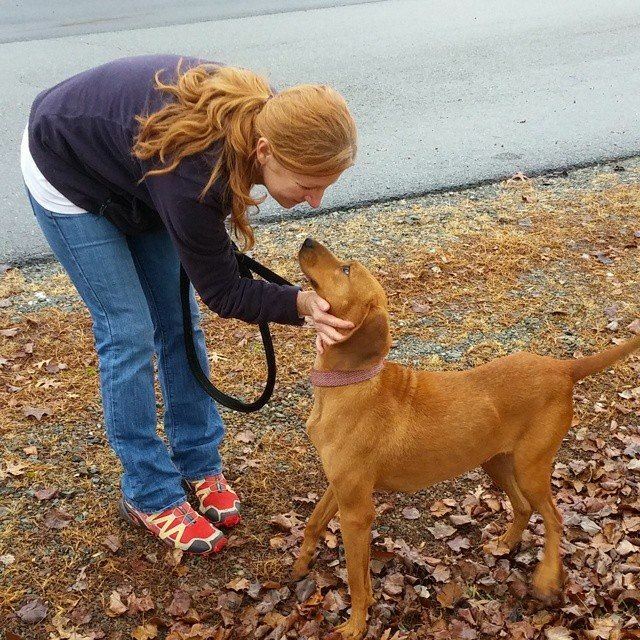 Roughly seven weeks after climbing into that Xterra and leaving the shelter in North Carolina, I was leaving one Xterra and climbing into another one with my new Mom. Timid at first, I looked at her, sniffed her legs, she smelled like other dogs, and her hair was the same color as mine…but there were a lot of new smells surrounding us and soon I was distracted by them. I dragged new Mom Denise all around the parking lot at the elementary school where she and Debbie met. They were trying to talk and I was displaying my impeccable leash manners! Not! Before I knew it, Debbie was getting back into her car and I was getting into its twin. Moma Denise kept talking to me, giving me treats and trying desperately to take a photo of me, but I wouldn’t sit still. I wandered around the car for a bit, then settled once we started moving. I wasn’t really sure what this meant, but if my foster mom trusted her, well, this must be OK.
After a few hours, we pulled into a parking lot and I got out of the car. Moma Denise handed me over to some friends of hers, who I now call my Auntie Amy and Uncle Tony. 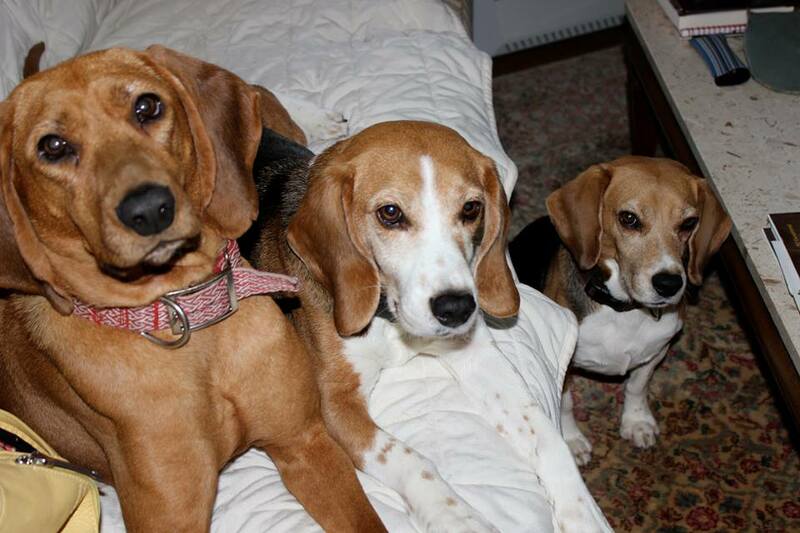 They held me as I watched her go into a building and quickly return with a pair of beagles! My new brothers! Moma adopted them after they were saved from a research lab years ago. We walked around the apartment complex together, sniffing each other and various other trinkets on the ground. Rain was coming and soon we all went inside. I stood looking around, them roamed freely, got some treats and quickly stole my brother Petey’s brown chair…and thus my new forever life had begun. I needed a third dog like I needed a hole in my head. I live in an apartment right now and I kept telling myself I could not have another dog until I get my own place. I would randomly search petfinder and our local shelters every now and then, but nothing serious. As much as I adore my boys with all my heart, I really, really missed having a girl in the mix. But still, I knew I had to wait…but then I saw those eyes. 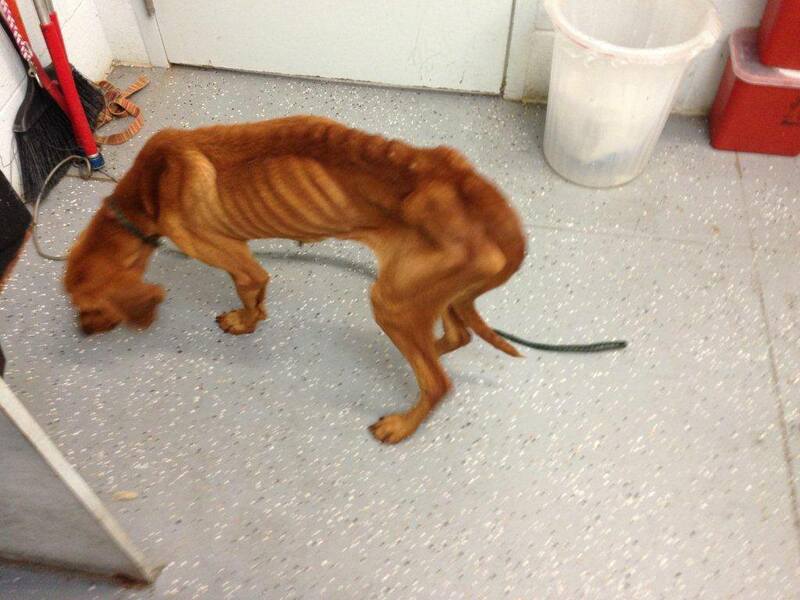 A friend of mine shared those photos taken of Surry at the shelter on October 14. It was actually the woman who fostered Lettie, my sweet awesome beagle, who taught Petey everything about being a dog after he came to us from the research lab. She died suddenly in August of 2012 when a tumor on her heart started to bleed. We never would have known it was there until it became life threatening, it was sudden and heartwrenching. 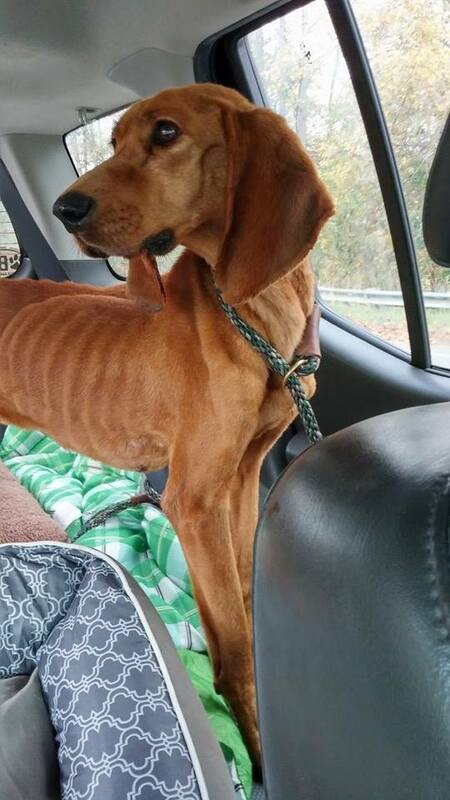 Lettie’s foster mom is in Richmond, nowhere near where Surry was found. She is well connected in the dog rescue world, but still, this was a very random share and I feel like because I saw it…because it came from her I would notice it…because of all that, Lettie had a hand in this. Those eyes. 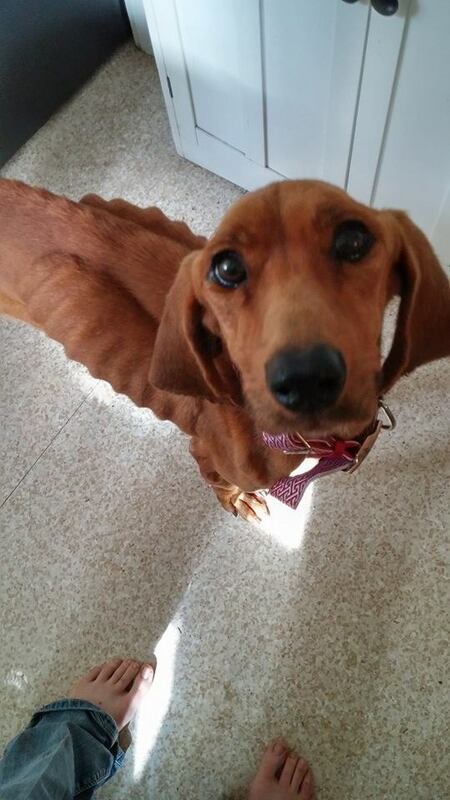 That poor emaciated skeleton with fur…most people would have been deterred, but I’ve always had a knack for seeing the heart in a dog that looks defeated and done. Her eyes were filled with hope and love and spirit buried deep, but I knew it was still in there. I sent an email and called the shelter asking how I could help, when could I come get her, what could I do? 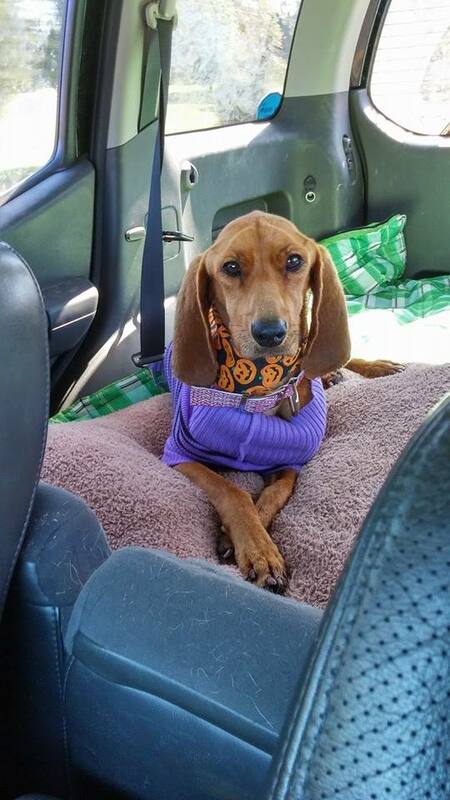 ABTCR had already called and was making arrangements to get her into foster care. So I contacted Jayne and let her know that I was ready to adopt whenever she became available. I was so drawn to her, felt connected to her. I was able to start communicating with Debbie to track Surry’s progress and eventually found out she would indeed be coming home to me and we made arrangements to meet up and make the exchange. I’ve never adopted a dog I’ve never met before and it didn’t occur to me the oddity of that until a friend pointed it out. But I felt like I knew her. She took a piece of my heart and held it the second I saw her photos. I had the terrifying thought that Surry might not like me! Well, none of those fears were realized…we are still getting to know one another, getting better and better at communicating and our bond strengthens every day. And so begins Surry’s Second Chance. I have followed this story from the very beginning on FB. 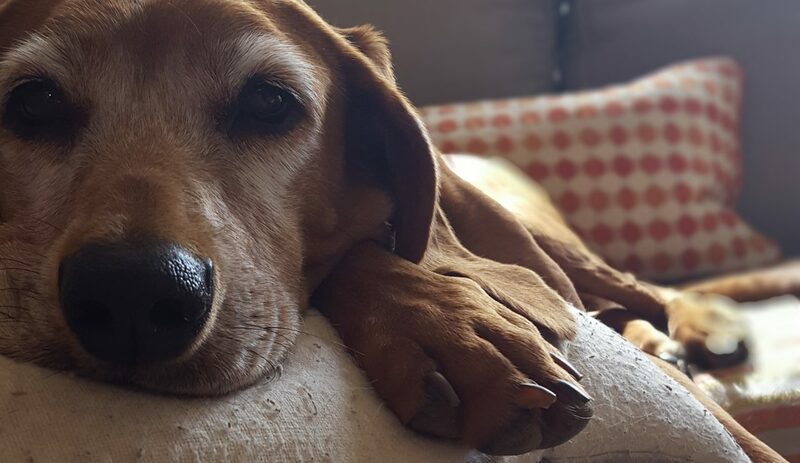 This sweetheart reminds me so much of my Redbone Coonhound/Beagle mix, Ginger. The story just warms my heart. awesome this hound had my heart from day one through all I seen I saw a survivor in her and so glad between ABTCR Debbie Baliey and yourself she is now gotten the family she deserves. 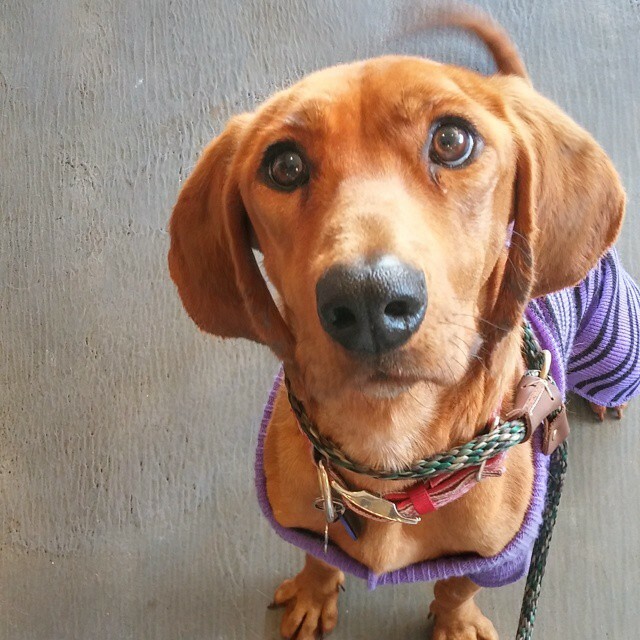 I too saw the very first photos posted on FB and my heart went out to Surry….especially knowing how amazing these dogs are. They ALWAYS forgive the most horrible neglect and abuse. They are always filled with hope that someone will come….and thank GOD that ABTCR was able to save Surry. Blessings to everyone who made this sweet girl’s SECOND CHANCE possible!